The Office of the Historian General is very pleased to announce the gift of a valuable 18th-century document to the Americana Collection. A petition asking Brigadier General Henry Knox for an increase in salaries and daily provisions signed July 9, 1777, by 61 workers of Springfield Artillery, Springfield, Mass., was presented to the President General by Joanne Shypula, Regent, and Reporter General Connie Olde, an associate member of the Princeton Chapter, Princeton, N.J., during April Board. The Princeton Chapter actually just stumbled upon the document while going through boxes of old chapter records. The document was among other papers and was rolled up in a paper towel tube and all things considered was in remarkable condition. 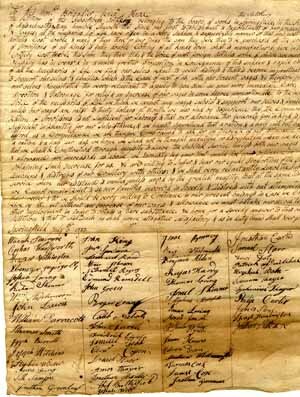 The chapter had the document professionally transcribed. They also worked to create a program with the transcription with a brief history of Brigadier General Henry Knox. You can access this program from the Reporter General’s Office. As many of you may know, this is not the first donation of documents concerning General Knox acquired by the Americana Collection. In 2007, NSDAR purchased 32 manuscript items pertaining to Knox and his family that were included as part of an estate auction in Pleasant Valley, N.Y. The Americana Collection is home to several additional items concerning General Knox including discharge papers signed by Knox and certificates of membership for The Society of the Cincinnati signed by Knox in his capacity as Secretary of the Society. General Knox was born in Boston in 1750 and joined the military at 18 years of age. Eventually he was promoted to major general in the Continental Army. He participated in most of the major battles of the Revolutionary War including Princeton, Brandywine, Germantown, Monmouth, and Yorktown. He led the expedition to transfer captured British guns from Fort Ticonderoga to Boston in 1776, an effort that forced the British to evacuate that city. Also, he led the Delaware River crossing and participated in the Battle of Trenton in 1776. Knox became a close friend and advisor to General Washington and became the first secretary of war on March 8, 1785. He died at his home in Maine in 1806. An exhibit on the Knoxes featured in the Americana Room 2007—2009 is now available online at http://www.dar.org/archives/general-henry-knox. For further information about NSDAR’s Knox holdings or the Americana Collection in general, please contact the NSDAR archivists at historian@dar.org.